Michael Travlos is one of the most interesting and compelling living contemporary composers in Greece. His album “Progressions” is devoted exclusively to his music. He has managed to create an exciting, unique, often intriguing yet very personal composition. The album contains 6 world premieres of songs recorded for solo flute, flute and harp, and flute and guitar. The musicians involved in the creation of the album are Iwona Glinka on the flute, Anna Sikorzak-Olek on the harp and Angelos Botsis on the guitar. In 2017, “Progressions” won the GLOBAL MUSIC AWARD OF EXCELLENCE – Triple GOLD Medal in three categories: Composer, Flautist and Album. In September 2017, the album was nominated for the International Classical Music Awards (ICMA) 2018. Born in Piraeus, composer Michael Travlos trained at the Athens National Conservatory and in Berlin (along with Isuang Yun) and led a variety of didactic classes in his native Greece. Flautist Iwona Glinka, in one of the series of albums discussed in this issue, presents Travlos’s music in exquisite performances. The piece “Las Birds Arias” (2003, revised 2015) consists of five parts, each of which is intended for a specific type of flute (standard flute, piccolo, and alto and bass flutes, with two movements for the standard flute). Glinka plays superbly on “Wymagania graniczą z wirtuozem” (“Requirements bordering the virtuoso”), and Travlos works in purely birdish references to a clearly defined modernist language. Related to this song is “Five Birds of the Forest” (2016), a set of miniatures in miniature. Each one is named (“Dudek”/ “Hoopoe”, “Kormoran”/ “Cormorant”, “Żuraw”/ “Crane”, “Sowa”/ “Owl”, “Jastrząb”/ “Hawk”) and each is individually characterized to perfection by Glinka. The presentation of the owl is particularly attractive: I promise that it will enchant you and make you smile. The dazzling majesty of the hawk completes the set. Captured on the flute/ alto flute and harp in 2016, “GBR” is a delicate dialogue between solo instruments. The musky sound of the alto flute depicts the haunting melody of the second movement. Lyricism is the essence of this song and I must admit that Travlos is a natural melodist. Three sections of the work are separately tracked in the current version. Anna Sikorzak-Olek is a superb harpist, and the relationship between the instrumentalists seems strong. The “Castle in Kwidzyn” pamphlet reveals that Glinka is in fact Travlos’s wife, and this piece from 2013 on the alto flute is dedicated to her. The deep sound of the alto flute seems to add a layer of mystery to the alleged story of the castle, which is located in the north of Poland. Written in 1996, “Duetti for flute and guitar” is a three-part fantasy, an active introduction leading to the rather conventional movement “Monotonia”. (The title is really a nod towards the quasi-ostinato technique applied so effectively here by Travlos, and the movement is indeed thrilling.) The central panel contains pointers to jazz, which forms the basis of the finale, clearly indicated as “A Bit Jazzy”. Angelos Botsis is a fantastic guitar player. In this piece, perhaps, particular attention is paid to the perfection of the recording, its sense of presence and pure detail; and yet, it is not too intriguingly intimate. Last but not least, “Progressions” for solo flute is an arrangement of the original oboe from 1983. Cast in five sections, it culminates in an immeasurable component of height and speed, perfectly realised by Glinka. Lasting just under 10 minutes, it provides a space to admire Glinka’s method in this music: it’s as if she’s telling a story, a slightly hypnotic tale perhaps. 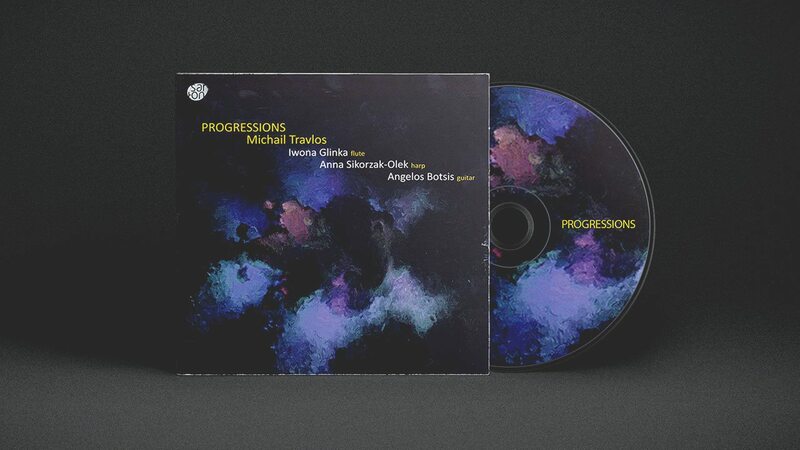 This version of “Progressions” is available on the album titled “Millennial Masters on Ablaze Records”, executed with typical high energy by the excellent contemporary music specialist Christopher Redgate, a perfect complement to the gentler, equally compelling reading of Glinka.